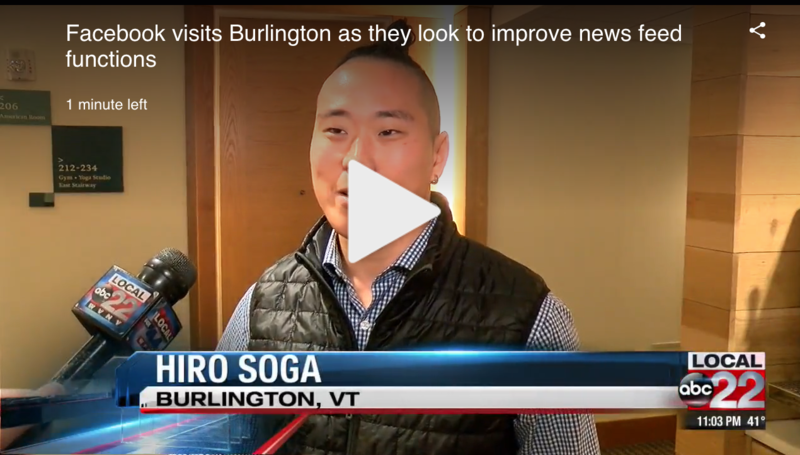 Our own Hiro Soga offered his commentary at the Burlington stop on Facebook's tour of smaller cities. ABC-TV Channel 22 captured the action. "To me, Facebook is just Mark Zuckerberg, but these guys are coming out here to help promote their platform," Soga said. "I know they've gotten a lot of backlash recently, but I think this is something good that will help instill a little bit more security or trust, especially with smaller markets like Burlington." Marketing Partners, Inc. announces the addition of Hiro Soga to its team as a marketing assistant. In his new role, Hiro will provide client services including social media management with graphic design and copywriting support. Hiro helps our clients create a strong presence on social media with compelling copy and captivating visuals. Before Marketing Partners, Hiro lived in Philadelphia where he graduated from Temple University and received a bachelor’s degree in advertising with a focus on copywriting. He interned at the Philadelphia Film Office and helped promote their new music sync agency.